Hi folks, Steve Toyama here. Just thought I would put up a quick post about a cool feature that I was always aware of but never really quite implemented into my projects as much as I could have. If you’re into motion graphics you’ve heard of Trapcode’s Particular. The feature I want to take a look at is its auxiliary system. If I wanted stroke animations I normally went to 3D Stroke, also from Trapcode. What I should’ve been doing was exploring the possibilities with Particular as well. A co-worker of mine created a really nice lower 3rd animation using this technique and it gave me the idea for this blog post, so all due credit goes to him. I only had to emit 3 particles from the main emitter and I set the position to the left side of the frame as they will be animating left to right. The particle size is set to 0 because we don’t need to see them. Actually, we are using these particles as the emitters for the particles that will compose the strokes we see later on. This part is pretty important. 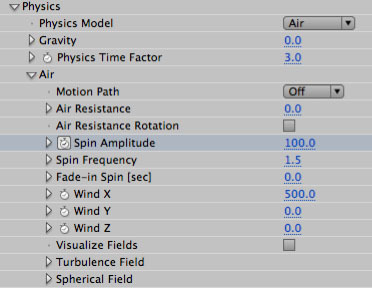 In the physics attributes enable the Spin Amplitude within the Air options. This is going to give you some really nice curves for your strokes. 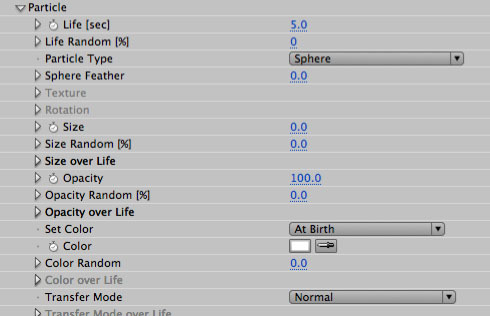 Play with this setting along with the Physics Time Factor for the speed of your strokes animating on. Also, set the Wind X to your desired amount as well. The settings in this section are going to affect the style and look of your final strokes so play around as much as you like. Under Aux System, set it from Off to Continuously and set the percentage to 100%. The Particles/sec will determine how smooth your strokes will look. If this is set too low you’ll start to see your strokes breaking up into the individual particles. 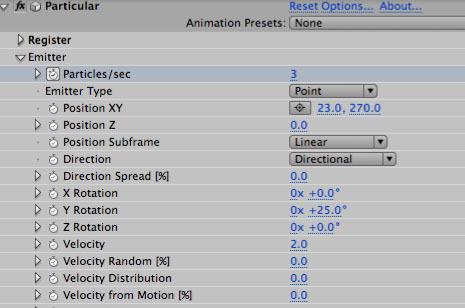 Don’t forget to set the velocity to 0 or your secondary particles won’t stay in place and create the stroke effect. The fun part is playing with the color and size over life to create neat looking variations of whatever look you are trying to achieve. Set the beginning and end of the particle size to 0 for a tapering look. I set part of the color over life to black to make it look like the stroke was disappearing and reappearing but of course it will only work with a flat black background. Have fun trying out different versions. Happy keyframing!